The Old Grammar School in the Shooting Meadows, Faversham, is one of the few surviving purpose-built Elizabethan school buildings in Britain. The property was confiscated by Henry VIII when he dissolved the abbey in 1538, and the school had to close. In 1576 the borough council successfully petitioned Queen Elizabeth I for return of the endowment, and the school re-opened. However, the school had no permanent premises of its own until 1587 when, as a result of community effort, the purpose-built premises pictured here were erected on the western edge of the Shooting Meadows, where archery was then practised and where the school's modern-day successor has its buildings and playing fields. 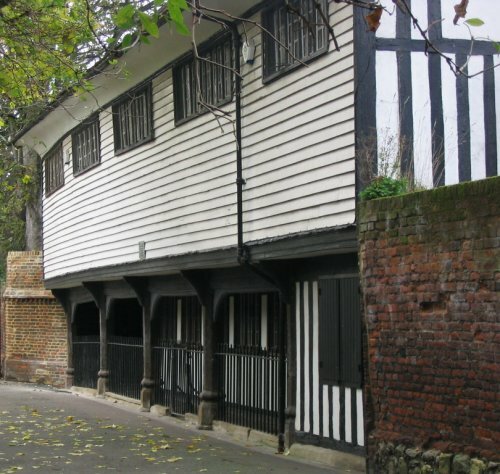 The new premises of 1587 were timber-framed, and 60 tons of oak were needed for the frame, which (as usual with this type of building) was first ‘test-assembled' off-site. The Elizabethan building remained in use as a school till 1879, when much larger premises (since demolished) were erected in St Ann's Road. For a few years it was used as dwellings, and its condition began to deteriorate. Fortunately, however, the town's Masonic Lodge of Harmony was seeking a permanent home of its own, and in 1887 was able to buy it and save it from gradual decay. Conversion and restoration were sensitively undertaken by Benjamin Adkins, an architect who was also a Lodge member. The first-floor schoolroom was altered as little as possible, and extra accommodation was provided by ‘under-building' where the covered playground had been at ground-floor level. Since 1887, two other Lodges have been formed and these now share use of the building with Harmony, which has formed a charitable trust to be responsible for its maintenance and management. It is one of the oldest buildings in Britain to be in permanent use for Masonic purposes. Thanks to the public-spiritedness of the Lodges and the trust, the Old Grammar School is now open to the public during the Faversham Society's annual Open House scheme on the first three Saturdays in July. Visitors then have the rare opportunity of seeing the kind of environment in which pupils of an Elizabethan grammar school were taught. There were no fountain or ball-point pens in those days, and pupils used ‘pen-knives' to sharpen the nibs of the quills they used for writing. With these pen-knives - in idle moments - they carved graffiti on the wainscotting, and these can still be seen. A specially remarkable feature is an early 16th-century carved panel depicting King Stephen and Queen Matilda, who founded Faversham Abbey in 1147. This was installed behind the chair of the Abbot at High Table in the Abbey Refectory. Somehow it escaped destruction when the Refectory was demolished and found its way to the Grammar School. The full story of the building is told in The Old Queen Elizabeth Grammar School, an attractive illustrated booklet published by the Lodge of Harmony and available at the Fleur de Lis Heritage Centre in Preston Street, price £3.00 (£3.35 by post).